Our friends at WarPig BBQ have been doing big things for the veteran community! 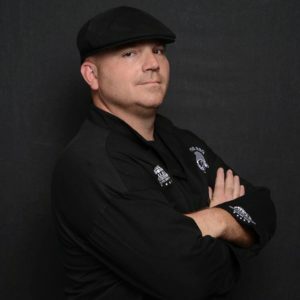 Meet Dennis, Pitmaster and CEO of WarPig BBQ. He’s an Army Veteran who is turning his award-winning sauces into support for our veterans and their families. Thank you for serving our country in the U.S. Army! Tell us about your military background. I joined the Army fresh out of high school. I wanted to take advantage of the free college money that was being offered. My recruiter told me to go to MEPS and pick a good job and, “whatever you do, don’t come back as a tanker.” So what do I do? Come back as a tanker of course! I was stationed in Germany for my entire enlistment, serving with the 3rd Infantry Division and the 1st Infantry Division. In 1996, we were deployed to the Former Yugoslav Republic of Macedonia as part of Operation Able Sentry. While there, we earned the Army Superior Unit Award for being the first Armor Battalion to serve a deployment as an infantry unit. How was WarPig BBQ born? WarPig BBQ began as a competition bbq team made up of Army vets and lifelong friends. We decided that we needed something to do on the weekends that would get us all together and allow us to drink beer and talk crap… So we discovered the world of comp bbq. Over the years, we were sponsored by a BBQ Sauce company that would eventually go out of business. It was then that I decided to try my hand at creating my own sauce. I called it FUBAR; For Use on Butts And Ribs. The very first time that I used it in a competition was the Houston Live Stock Show & Rodeo World Championship. I finished 8th in ribs and 24th overall. Right then, I knew I had a winning sauce. I ran out and got a DBA and started my business as WarPig BBQ. I figured that if I didn’t sell any sauce, at least I would have enough inventory for my cook team. I sold what I thought was quite a bit in the first 2 months. I actually signed on a couple of small retailers that agreed to sell FUBAR and things were looking good. My friends convinced me to enter HEB’s Quest for Texas Best contest in April 2017. When they announced us as the 1st place winner my life changed forever! Tell us about your team and some of the numerous awards you’ve won. My Team consists of 6 members including myself. 3 of us grew up together in Crosby Texas and the rest we picked up along the way. We’ve been competing since 2009 and have won trophies at every World Championship we have competed in including: HLS&R, The American Royal and the World Food Championships. WarPig has gone on to develop products that are available online as well as at one of the largest grocery store chains in Texas. How did your military background help you turn your passion into a successful business? My military background helps me stay grounded in my day-to-day business dealings. I don’t allow minor issues to derail my mission. I also use my background to stay focused and meet deadlines. When HEB places an order, there is no option that allows for missing the delivery date. I do whatever it takes to make sure every shipment is out the door on time and arrives safely in the warehouse. 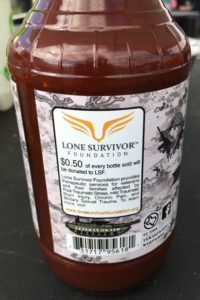 A portion of the proceeds from the sale of your SNAFU BBQ sauce is going to benefit Lone Sur vivor Foundation and we greatly appreciate your support. What is your connection to LSF and why have you chosen to support us? I read Marcus’ book several years ago and was overwhelmed with the amount of strength, courage and dedication to the mission he and his team exuded. I first reached out to Marcus via an email address I found on his website. I wanted permission to have his team painted on my BBQ pit as a tribute. I got a response right away saying go for it! Since then I have been a supporter of LSF and Team Never Quit. I volunteered with LSF at the celebrity softball game and it was then that I knew I wanted to find a way to do more for the charity. After the success of our partnership between FUBAR and Folds of Honor, I wanted my next sauce to team up with the Lone Survivor Foundation. I’m very excited to announce that starting in January, SNAFU Elite BBQ Sauce will be in 178 HEB locations across Texas! 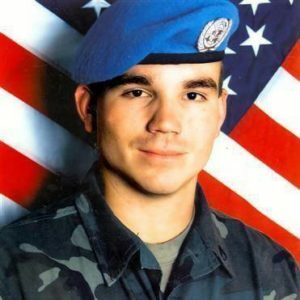 Is there anything you want to share with your fellow veterans? I want all veterans to know that you are not alone in this world. There is a network of your brothers and sisters that are here for you and will stand by your side through anything. And You Are Never Out Of The Fight! To purchase SNAFU BBQ sauce, please visit http://bit.ly/lsfsnafubbq. If you would like to support Lone Survivor Foundation with your business, please contact us.